We often read about how “someone found God”; usually after a life event that caused them to evaluate things. But did you know that God pursues us? Because of His very nature – which is love – He seeks to have a relationship with us. He created us for His glory and even the many names and titles of God reveal His pursuit. Take a look at these 6 ways God pursues us. I pray that if you are looking for answers in your life right now that you consider that perhaps our wonderful Heavenly Father is drawing you to Himself. Jehovah-Nissi means “the Lord our banner”. I am reminded of the children’s song “His banner over me is love” whenever I think of how Moses built an altar to God and he called it “The LORD is my banner” (Exodus 17:15). God gives us love so that we are not afraid. We are His creation and He loves us. He wants to have a loving relationship with us. A good relationship must be pursued and He pursues us with love. God offers peace for those who have faith in Jesus Christ. His pursuit is not as in the heat of battle, but it is gentle and peaceful. He speaks to us through His word, the Holy Bible. When we accept His peaceful relationship we will hear His still small voice (1 Kings 19:11-13) which guides us upon His gentle and safe path to an abundant life. Sometimes we lose sight of how wonderful God is. We forget that He is forever drawing us to fellowship with Him. I believe that sometimes God pursues us through illness. He allows us to become ill so that we will spend more time with Him. Some of my greatest conversations with Jehovah have been those times that I needed His help to be healed. We must praise Him, even in the hardest of times. God pursues us by constantly reminding us that HE IS. He never sleeps. He understands everything. He lifts us when we are weak. Even when we fall short of His glory – and we all do (Romans 3:23), He is still there waiting for us to reignite our relationship with Him. When we accept God’s gift of grace we have been given an everlasting place with Him. We can be sure that when we leave earth we will be present with the Lord. We know this because God gives us His Holy Spirit as a promise of that everlasting life and once He gives it to us He does not take it back (John 5:24;John 6:38; John 6:47; John 10:29;Ephesians 1:12-14; 4:30; 1 John 5:13). Even when we may feel very alone in this world we should rest in the assurance that God pursues us. In fact, He loves us so much that He gave the most precious gift of all time. He sacrificed His only begotten Son to pay our sin debt. Jesus was born as a babe, grew into a man and never, ever sinned – because He was fully man and is fully God. Because He did not sin He did not owe the same wage of sin that every other human owes (Romans 6:23). Yet, Jesus willingly gave His life on the cross as a ransom for our own. He paid that debt that He did not owe. Once we believe what Jesus did for us – make it personal — no matter how far away we fall from Him, God still loves us and pursues us. As long as we live in this sinful and fallen world we will sin and as believers although we no longer owe that sin debt (because Jesus paid it all) we may still have to deal with the consequence of sin. God’s pursues us, teaching us the effects of sin on our life. He never gives up on us. He never lets go of us. All because He loves us and because He is faithful. Related Reading: Why Does God Love Us? Do We Really Deserve It? Hello and thank you for writing this article. I’m going to be preaching at my church second Sunday and this article really helped me to get my thoughts in order. I may not used everything that you wrote but it helped me narrow down the words I want to use thank you very much. I see in some of these cited Scriptures that God loves us. I don’t see here that He pursues us, so the title and conclusions seem somewhat enigmatic. Hello Barry. 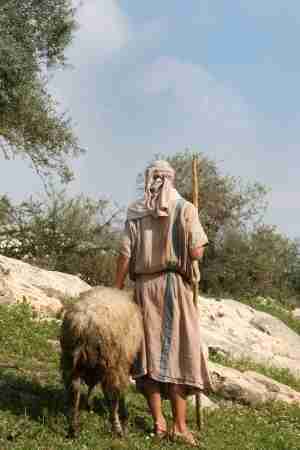 Notice that the Prodigal’s father was watching and waiting for him, and ran to greet and embrace Him. John 6:44 shows in the Greek that God just doesn’t draw us to Christ but the Greek says “drags” as in the same word when Paul & Silas were dragged into jail. Romans 8:28-30 also shows that ” And we know that for those who love God all things work together for good,[h] for those who are called according to his purpose. 29 For those whom he foreknew he also predestined to be conformed to the image of his Son, in order that he might be the firstborn among many brothers. 30 And those whom he predestined he also called, and those whom he called he also justified, and those whom he justified he also glorified.” God uses the word “call” 3 times. John says we “who were born, not of blood nor of the will of the flesh nor of the will of man, but of God” (John 1:13). Ephesians chapter 1 shows Who made the first move, and it wasn’t us, as dead men can’t respond to anything (Eph 2:1-2). Does this help. This is crystal clear that God had to draw us, God had to call us, and God had to quicken us…that is all from God! Please note that I am not the author of this fine article sir, but I thought I might help contribute to your understanding of biblical doctrine as others have me. Thank you.